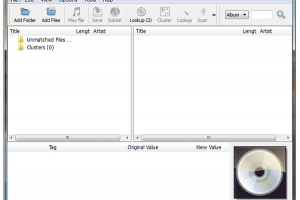 "Facilitate updating metadata tag data for your audio files"
The product presented here is called MusicBrainz Picard. It’s a music tagger supporting all popular audio formats, using AcoustID audio fingerprints to identify every file you have in your music collection and as such enable you to obtain missing metadata tag information. MusicBrainz Picard will furthermore enable you to lookup a complete audio CD, only requiring a single click. As shown on the screenshots placed in the preview images section of this page, this application features a clean graphical user interface, suitable even for the novice among you. It supports drag-and-drop functionality for folders and files including MP4, WAV, FLAC, MP3, APE, OGG and other formats. So, if interested in organising and updating the metadata tag information of the music in your collection, consider proceeding to the download to give this dedicated application a try.